Can a “Man Bun” Lead to Hair Loss? You may start out looking like Leonardo DiCaprio, but you could end up looking like Ed Asner. 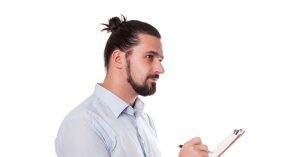 “Man buns,” the 21st-century hairstyle that’s favored by Hollywood movie stars and urban hipsters, can bring about hair loss, according to recent scientific reports. Constant pulling of hair can cause scarring of the scalp and even permanent loss. Robotic Hair Restoration Long Island would like you to understand the facts, dangers and hair loss treatment options connected with this style. A man bun described quite simply, is a ponytail that’s tightly pulled back. The hair is pulled and twisted into a circular coil worn on the top of the head. It’s always been a popular hairstyle for women who’ve come up with variations on the bun such as the top knot, sported by the likes of Jennifer Lopez and Jennifer Lawrence. But in recent years, male A-List celebrities such as DiCaprio, Bradley Cooper, and Jared Leto have adopted the look. But pulling hair into a tight bun can bring some unwanted results. It can lead to a condition called traction alopecia, according to a 2015 article by Mic. Traction alopecia is a type of hair loss concentrated around the temple and behind the ears. It is caused by traction and by pulling. When hair is pulled from the roots, it can cause tension and inflammation. This can prevent hair from growing. It’s not just ponytails and man buns that cause traction alopecia. Several other types of hairstyles can also cause the condition. You can also get it if you wear tight braids or cornrows, dreadlocks or extension braids, according to the website Hair Sentinel. It can be caused by tight hairpieces and hair weaves that are attached with glue, clips or tape. Repeated use of tools used to hold hair in place such as hair clips, slides or barrettes, headbands, tight headgear like cycling helmets and hair rollers can also cause traction alopecia, according to Hair Sentinel. If you have a psychological condition known as trichotillomania which causes you to repeatedly pull out hair with your hands, you can also suffer from this type of hair loss. A dermatologist told Mic that the man bun phenomenon is at least partially to blame for making traction alopecia more common among men. If caught early enough, treatment is simple. Don’t pull your hair back so tight, and your hair will become healthier. But if being kinder to your hair doesn’t work right away, the hair loss may have become permanent. That usually means discussing a surgical option. RHRLI offers hair treatment options for both men and women. We’ll start you out with a consultation and a scalp examination. If a surgical option is needed, you’ll be in the right hands because we are the only hair loss treatment center on Long Island that offers a state-of-the-art procedure called Robotic Follicular Unit Extraction (RFUE). Unlike traditional hair transplant treatments like Follicular Unit Transplantation (FUT), or “strip surgery,” RHRLI uses a minimally invasive procedure that won’t be as painful and significantly shortens recovery time. Other follicular unit extraction (FUE) techniques that use manual devices are susceptible to human error. The RFUE technology has unmatched precision and accuracy which is consistently reproducible. RHRLI uses the ARTAS® System, which employs robotic technology to assist physicians in the hair transplant process. We will find the healthiest hairs to use for transplant and the result will be a more natural and healthy looking head of hair.